Follow @placardabuse for the stream of incriminating evidence. But is NYPD’s internal discipline making an impact? In February, Inside Edition ran a segment about the widespread practice of obscuring plates on police vehicles in Lower Manhattan. And if you follow @placardabuse on Twitter, you’ll see plenty of evidence that officers are still getting away with it. Here’s a look at some offenders @placardabuse and other license plate fraud spotters have recently called out. 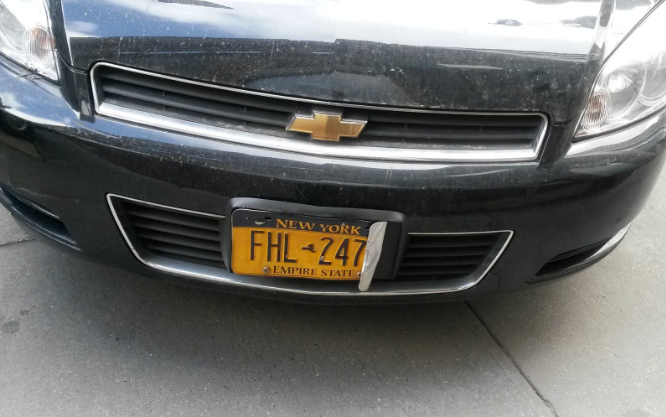 Meanwhile, in the parking lot at NYPD headquarters, @placardabuse has documented cars with folded license plates and some with no license plates at all. All this license plate fraud comes on top of garden variety placard abuse like parking illegally on sidewalks and in no standing zones, interfering with deliveries and pedestrian movement. Commissioner O’Neill said he’d do something about this abuse, but aside from the occasional ticket, NYPD doesn’t seem to be keeping up the pressure on its own offenders. I guess “broken windows” policing doesn’t apply within the NYPD. The fact that they’re so brazen about this makes it pretty clear that they’re 100% confident that any officer who stops them is going to send them on their way once they flash their badge. And this just points to an institutional culture of corruption in the NYPD, same way it’s always been. They may have gotten a little better at their PR over the years (i.e. Twitter) but underneath it’s just the same old boys club, bent from root to branch. Is it any wonder that lawlessness is endemic in New York? Why on earth should anyone respect the rule of law when the people who enforce it are as crooked as a dog’s hind leg? Tolls should be free for all 1st responders on and off duty. I happen to disagree – but, more to the point, the fact is that right now tolls aren’t free for all 1st responders, and any 1st responder who deliberately evades the toll is engaging in theft of services. If you don’t like the current policy, then propose that it be changed. Until such a proposal goes through, it is what it is. On duty, yes. But not for commuting. Until the concept of “extending courtesy” is disciplined as a malicious act of endangering the public, this practice will continue. Then negotiate that in a contract. @disqus_XBaEBm1AqT:disqus You nailed it. Any ‘civilian’ doing this, would be busted in a heart-beat. This illustrates that the problem isn’t with just the actual license miscreants – but the ENTIRE NYPD. Off duty? Why? Off duty they are the same as any other civilian. And they should only pay water and gas every second month……. 1st responders are never really “off duty.” This is the least we can do for our 1st responders is offer them free tolls and parking. And why not donuts at any Dunkin’ Donuts. Amirite? How? It isn’t like the police department controls tolls. They’re set by the Port Authority, MTA, Thruway Authority, etc. This is actually emblematic of a huge problem facing police departments all over the place. It’s an enormous liability to the reputation of the police, and at the NYPD O’Neill is right to tackle it. In theory, someone should decide to become a cop because he or she cares about laws and people living by them. Cops can do that not just by handing out tickets and making arrests, but by setting good examples for the rest of us in the way they live their lives. If they did that, they’d earn respect as pillars of the community and model citizens (I know, the phrase sounds hopelessly quaint at this point, but it’s true). Instead, if they abuse their “privilege” at every turn, it makes it seem as if they might not have gotten into policing for the right reasons, but did so cynically, in order to be above the law. It earns disrespect from the general public. Using lights and sirens to get through red lights, illegally heavily tinted windows, obscured license plates. Parking in crosswalks. All of this kind of stuff furthers a culture of us-vs-them and mutual disrespect between the police and the public. I don’t see the logic in that at all. They’re paid a salary which they agree to when they’re hired, and that salary does NOT include free parking or tolls. And the fact that they are so brazenly corrupt pretty much wipes out the whole “the least we can do” sentiment in my eyes. Let’s have a reformed, law abiding police department, and then we’ll talk. At the very least, the NYPD could simply pay the tolls incurred by employees, presumably by means of an employer-issued EZ-Pass. And some of the facility operators might be willing to offer lower rates to the NYPD. However the details are worked out, it’s something that could potentially be negotiated into the compensation package for a police officer. As of today, though, it is not in the compensation package, and any police officer who deliberately obscures or mutilates a license plate in order to obtain free passage across a toll facility is knowingly engaging in theft of services. This is the least we can do for our 1st responders is offer them free tolls and parking. No, the least we can do is to provide them with the salary and benefits that they agreed to accept in exchange for accepting their job. Free tolls and parking were never part of that agreement. Nor, in my opinion, should they be part of that agreement, since I think it is very poor policy to offer significant discounts to people who choose to drive without offering the same cash value to those who may choose to get around by other means. Promoting driving over all other modes ensures that very few police offers will opt for modes other than driving. A police force that nearly exclusively gets around by car is a police force that can’t quite comprehend that people who get around by foot or bike or bus or subway also have places to go and also need to arrive at their destinations safely. But, getting back to the point at hand, regardless of what you or I think an appropriate compensation package should be, the fact remains that the compensation package for police officers today includes neither free tolls nor free parking. There is a word for taking what you’ve unilaterally decided somebody else owes you: that word is theft. Unless there station house has a parking garage they should not even be driving to work and parking on the sidewalk. They should be taking mass transit just like everyone else does to get to there place of work. I rather the MTA give them free rides when traveling to and from work then have all the extra cars on the roads parking illegally all over the city. Does mass transit serve all work shifts? Say 8 PM to 4 AM and 4 AM to noon? I worked those shifts for 20 years. Corrupt police should be executed. Beheaded, in public. It is completely unacceptable to have police deliberately breaking the law. It makes them worse than King George III’s soldiers. This is why NYC needs the Mayor to organize a militia to arrest the crime gang in blue. Step one is to completely defund and abolish NYPD so that the crime gang cannot pretend to be law enforcement any longer. I see no other alternative. Militia. Citizens’ arrests. Haul the crime gang in blue before judges. Best done with direct support of the Mayor and City Council. Last week Inside Edition went national with the story of NYPD personnel who use illegal license plate covers to evade toll readers and traffic enforcement cameras. 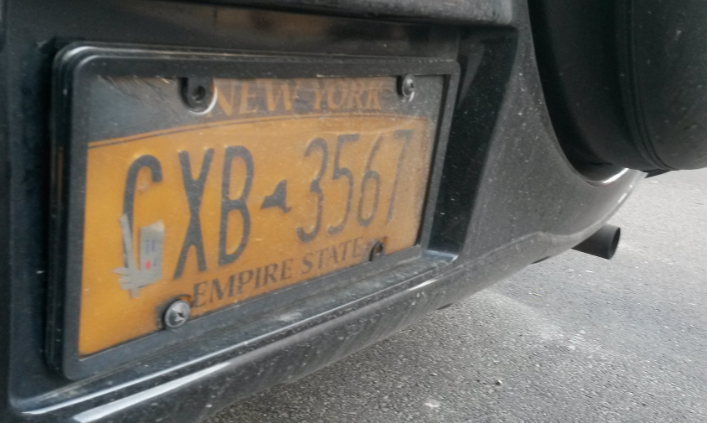 Reporter Lisa Guerrero found scores of vehicles in Lower Manhattan that had some type of cover to obscure the plate, and all of them also bore law enforcement placards.